There’s humility in the process. August 15, 2016: Car Window Poetry didn’t have national news features or people being impacted by over 12,000 encouraging poems shared worldwide. I look back over a year later, flipping through notes I scribbled and sentences I strung together, and realize not much has changed — nor is that a bad thing. Sure, Car Window Poetry has evolved. But it’s something I couldn’t and still can’t spread on my own. As someone who seeks to live and love like Jesus, I believe the vision for Car Window Poetry, as well as the growth we’ve experienced in the past year and a half, came from God. This fills me with gratitude as I remember I get to play a small part in the greater story God is writing. No matter where you’ve placed your passions, I believe it’s important to revisit your process every now and then as a reminder of where you began and the “why” you started out with. 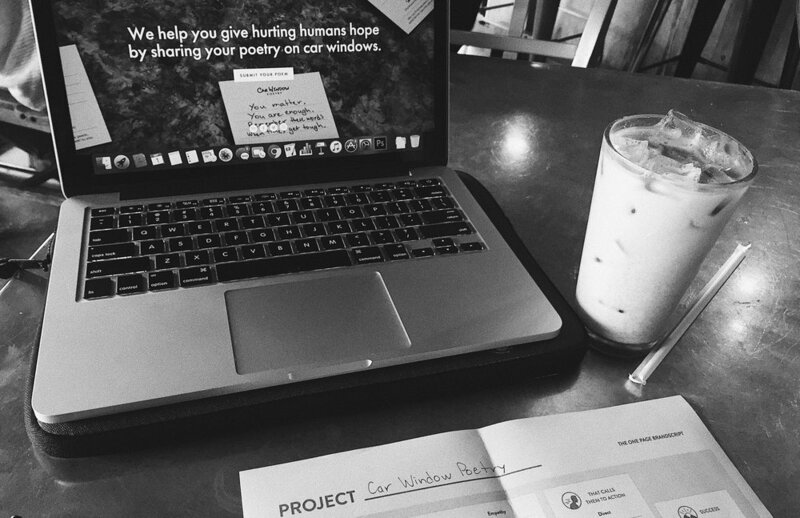 Folks like you are now inspiring kindness through Car Window Poetry in cities I’ve never even been to, but it’s still the project I brainstormed on the couch in my dimly lit living room while eating a lukewarm meal before yoga class. Never outgrow where you came from. It’s still at the heart of who you are. Click here to see more photos from starting Car Window Poetry through our visual, behind-the-scenes experience, The Process!